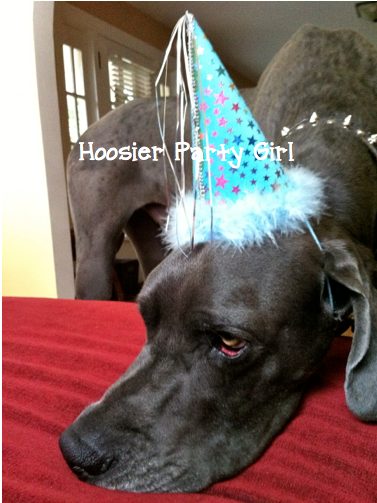 In case there was any doubt that I love a good theme party… I’ll even throw one for a doggy birthday. Don’t let him fool you though, he loved his party! This was just posed while waiting for all his friends to arrive. 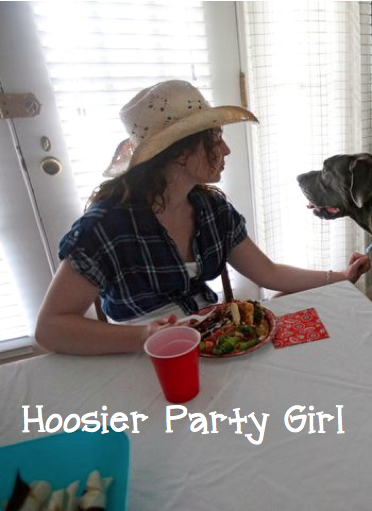 Someone used to love playing “sheriff” at the dog park and trying to break up fights, so we went with a cowboy theme. Most of the decorations came from Oriental Trading Company. 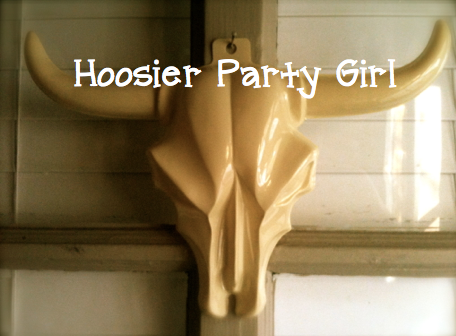 I don’t love their name, but they are a good supplier for inexpensive party goods. These were easy to hang all around the back yard. There was also a giant cowboy on the front door instructing people to go out back. We didn’t get a photo of him, but he is in the basement somewhere. 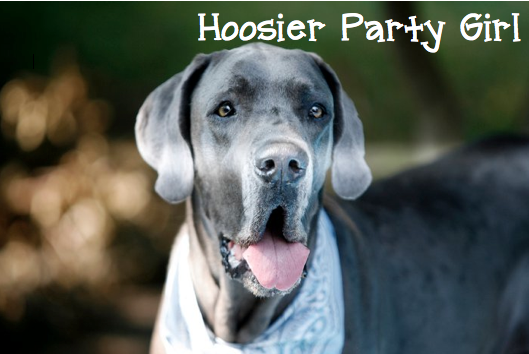 There were bandanas for each of the dogs in a variety of colors to put on when they arrived. Some of the dogs even came in costume – one with a holster and pistols! 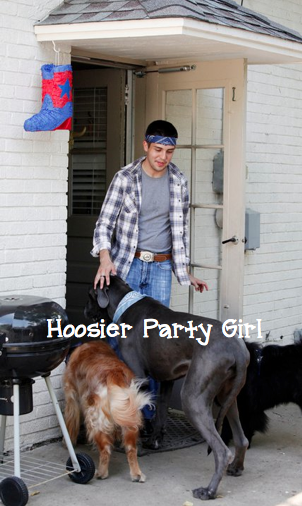 There was a boot piñata which added decoration, but it was also filled with dog treats. They were fascinated by it, but they did not tear into it with quite the gusto I’d imagined. In addition to the dog treat piñata, I made pup-cup cupcakes. I filled reusable cupcake liners (so the dogs wouldn’t eat them) with whipped cream and froze it. It shrinks while freezing, so right before serving each pup-cup cupcake got another dollop of whipped cream. They were certainly a hit! The humans had barbecue pork, corn on the cob, fresh bread, fresh salad, and sugar cream pie. 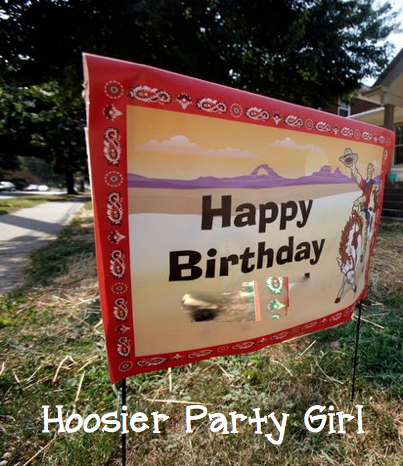 Don’t forget the red handkerchief napkins and cowboy plates! 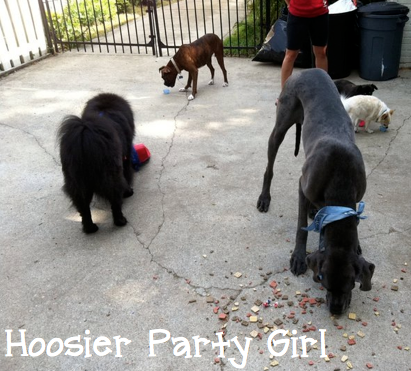 You can also see some of the party favors I made for the pups. Each doggie got three rawhides wrapped in raffia and tied in twine to take home with them. Since he has a summer birthday, we had a large watering hole for all the dogs to keep cool. We had planned on keeping them outside, but some of them got bothered by the neighbor’s fireworks. Even with nine dogs and their people traipsing through, my house was the cleanest it has ever been after a party. All the dogs got along swimmingly as well – despite a variety of breeds and sizes – but we made sure we knew all the dogs and owners well enough to know our Sheriff could take the day off on his birthday. Professional photography provided by Danese Kenon.